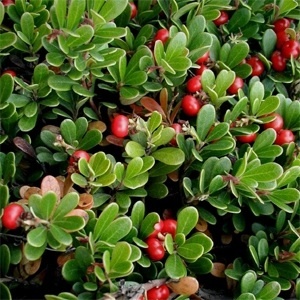 Uva Ursi plant, Arctostaphylos uva-ursi, is sometimes known as Bearberry. Traditional food and medicine plant of the Native Americans. The Chippewa Indians combined the leaves with tobacco to create a smoke to treat headache. A tea or tincture treats urinary tract infection. Attractive groundcover. Uva Ursi plant is native to the Northern Hemisphere and is adaptable to most soils and positions. Drought and frost resistant. An evergreen perennial to 0.2m x 0.45m. Seed for Uva Ursi plant.